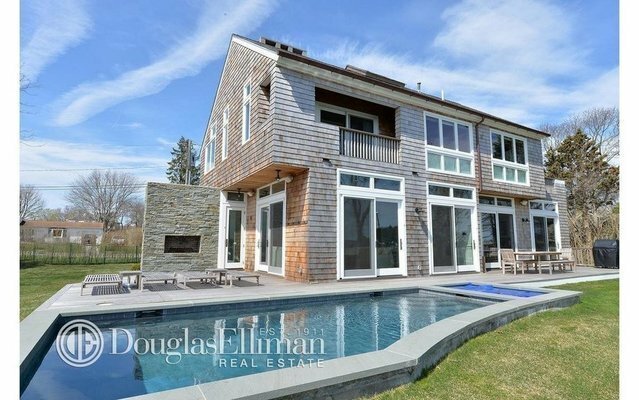 With amazing views of Lake Montauk, this two story contemporary home sits on just over a half acre. As you enter through the front door your eyes are drawn to the lakefront views through wall-to-wall sliding doors. The living room and den are connected with double sided fireplace. The den having its own access to the back porch and outside fireplace. The kitchen has all high end appliances along with views of the water through yet another set of sliding doors. The downstairs en-suite bedroom has its own entrance. Upstairs you'll find three additional bedrooms, with views of the water from each one, as well as two full bathrooms. The master bedroom has high ceilings, its own porch overlooking the lake, double sided fireplace, steam shower, double vanity and tub. Additionally, the upstairs has a side porch perfect for watching sunrises and sunsets from both directions. Through the back doors you'll find a dramatic waterside heated gunite pool, hot tub and outdoor fireplace with yard to spare before the gate to the waters edge.